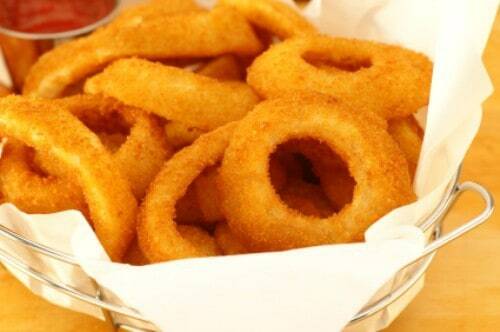 You can make Sonic Onion Rings just like they do with this recipe. It isn’t a top secret on how to make sonic onion rings. 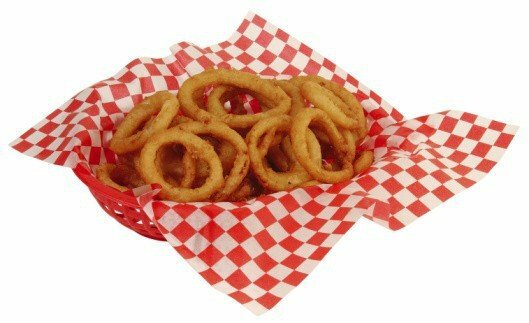 This recipe was generously donated by Kyra McArthur, and Kyra really knows how to make Sonic Onion Rings. Please not the aren’t exact, while battering the onion rings you will need to add a little more corn meal, or even flour. Do not worry about this use, what you need, and have fun. Make Sonic Onion Rings just like they do. Slice onions 12 inch thick. Place rings into bowl of ice water. Take out rings one at a time and coat with flour. Gently dip ring into 2nd bowl of ice water, and then coat with corn meal. Drop into hot oil and fry till golden. Drain on paper towels. ENJOY! Wow….The recipe in 1977 was this: Onion, into water, then into lightly salted flour, then into ice milk mix, and finally…into cracker meal….Lay them flat on a sheet tray and pop into freezer…That was it…don’t know what they do now, but that was the original recipe when I worked for them all those years ago. I knew this recipe was wrong right from the start bc Sonic onion rings have a sweetness, one that doesn’t come from the onion itself, and there are no ingredients in this recipe that are remotely sweet. I’m not saying this recipe isn’t good bc I haven’t tried it yet, but I was looking for a recipe closer to theirs. I love these onion rings. Can you please share your secrets with me. I can’t afford to eat out but maybe I can make them..
WRONG, WRONG, WRONG!…The second dipping is NOT another bowl of ice water…It is ice cream mix. You can buy it in half gallon cartons from Dairy Fresh®. You can also used melted vanilla ice cream. AND…the second coating is NOT cornmeal…it is cracker meal You can buy it at most grocery stores on the baking aisle. For best results: layer the coated onions rings on a baking sheet that has been covered with wax paper…then freeze for a couple hours or overnight before cooking…Cook from frozen state. They use a wet mix and then a dry mix. Then they put them on a plastic tray and leave them in the cooler over night. They dont freeze them.they just let them dry up a little. I know the second dry mix has powdered milk. Actually it comes as 3 powders one you add water to make a base mix this is also used as the third step. It goes wet mix, flour mix, wet mix, crumb mix. They come in big bags so I do not know exact ingredients but I worked there for 8 years. When did they start selling bagged onion rings? The mix comes in big bags .. I was the Manager at Sonic for 5 years . So you miss under stand what he was talking about .. We cut the Onions and dipped in the in the mix and then in a wet mix then back in the Mix that came in the bags ..
added a little salt, pepper, and garlic powder. That made a big difference from the first batch. There has to be something more, I can taste something akin to ‘allspice’ , con’t thing flour and corn meal are the ticket. Not like any Sonic Oncion Rings I’ve ever had! Out of the three places I worked at during college, we never added anything similar to allspice. It was pretty much salt and pepper were the only spices at the two fast food places, and the one place where I did short order cooking.